Demand for the Oscar fish has grown in recent years because of their attentive natures and adaptability to captivity. Some types of Oscar fish even respond to training, and can be taught to enjoy petting or how to roll over. They do require larger tanks and heavier duty aquarium filters, as Oscar fish can increase in size as they grow to reach a full foot in length. Oscar fish display distinctive behavior that at times mimics the dog by the way they shake their head and tail, hence the nickname “The Water Dog”. The fish owners believe that Oscar fish can recognize them by swimming closer to the fish tank’s wall and “greeting” them. Some owners are proud to be able to hand feed their beloved Oscars. There are numerous types of Oscar fish, due to the ease in breeding. The more common types of Oscar fish display a unique rainbow of colors like Albino, Lutino, Lemon, Yellow, Red Oscar and Tiger Oscar fish. However, there are many more variants because cross breeding is not uncommon. More rare of these are the Veil Tail Oscars or the Albino Tiger Oscar. There are also several very rare varieties of Oscar fish. The Sunshine Lemon Yellow Oscar fish is extremely bright yellow, and the Bloody or Super Red Oscar a deep, vibrant red. Some types of Oscar fish are “dyed,” and it is important to never buy dyed fish. While they may look bright at first, these colors eventually fade, and the process of dying makes the fish weaker and more prone to disease. 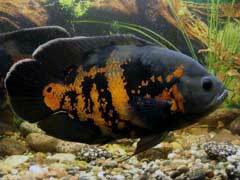 Oscar fish diseases are rare; the only one known to affect them is a disease accompanying vitamin deficiencies. This disease, known as Head and Lateral Line Erosion, occurs when there is insufficient Vitamin C, Vitamin D, phosphorous and calcium in its diet. Thus, Oscar fish food should be monitored and portioned for the right nutrients. This readily available and attention-loving fish is a welcome addition to any large aquarium.